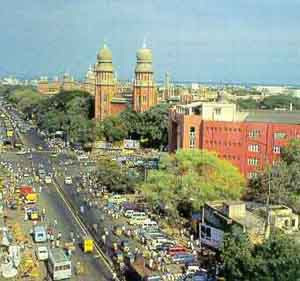 Chennai, Jan. 1: Chennai cityscape has undergone tremendous changes in the year gone by. The landmark Central Jail is razed to make way for the annexe of government general hospital. The landmark Kalaivanar Arangam is razed to make way for a modern auditorium. Padi flyover, Pallikaranai flyover at two different ends of the city and other new flyovers have made commuting easier for Chennaiites. Nearly 230 parks have been renovated, expanding the city’s lung space. People were allowed to visit the 172-year-old Central Jail before it was demolished in July to accommodate extension of government general hospital. The 35-year-old Kalaivanar Arangam was demolished in December and a new auditorium is coming up at the place as part of the upcoming new Secretariat complex. Marina beach got a make-over just at the end of the year, redefining the experience of the visitors to the second longest beach in the world. The city’s bus stops sported a cosy look and the process is yet to be completed. Three platforms at the Central railway station in the city got expanded to accommodate 24-coach trains. New subways near Saidapet, Thillai Ganga Nagar and airport and new flyovers in Padi, Pallikaranai, M.K.N. Road, Cenotaph road made traveling easier. The city’s waters got its first private leisure boating service. The works for connecting port with national highways started. The process of cleaning up Cooum river started with the setting up of Chennai River water authority. The city’s traffic islands are decked up with fiberglass sculptures of traditional Tamil images such as Poikkal Kuthirai, Puliyattam, Therukkoothu. 42 more such sculptures at traffic islands will alter the cityscape and A vestige of British era, King George V’s statue was removed from public space, and landed in the government museum at Egmore. Just one year into the project, the restoration of Adyar Poonga in 58 acres near Adyar estuary is progressing well ahead of its target. It is already looking green and inviting migratory birds to the heart of the city. The city is looking forward to have a world-class Secretariat, Asia’s second biggest library and a world-class airport in 2010 and many more flyovers. Despite continuance of garbage burning at different parts of the city, efforts are on to make the city cleaner and more livable.